Interlaken’s roll-call of natural scenic attractions has long been celebrated by artists, photographers, musicians and poets. The town itself, beloved by Schubert, Byron and Goethe, peddles all the tropes of a picturesque Swiss village, not least its crystalline views of the Jungfrau and Eiger. All the more reason to check into Maison Bergdorf, Mirko Beetschen and Stéphane Houlmann’s new guesthouse. Until the pair – a journalist and a former hotel manager – bought the property late last summer, the 19th-century chalet had been a private residence. It has now been refurbished into a handsome eight-bedroom property complete with a suite of three parlours, fireplace, and kitchen alongside generous balconies, two large verandas, terrace and garden. All offer Instagram views of the snowy mountains. The entire house can be rented for long stays which, frankly, is a temptation – the interiors are swathed in a gleefully eclectic mix of floral wallpaper, antiques, mid-century furniture and contemporary art. 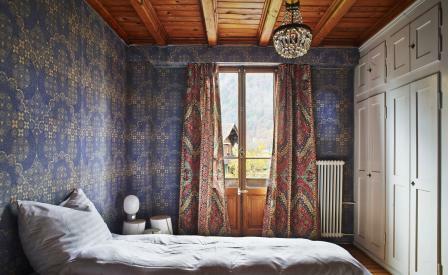 ‘The interior design and decoration of the place is an ongoing project and the guesthouse gets more beautiful by the week,’ says Beetschen modestly who, with Houlmann, runs a creative agency, after which the guesthouse is named, specialising in copywriting, interior design, public relations, and books.